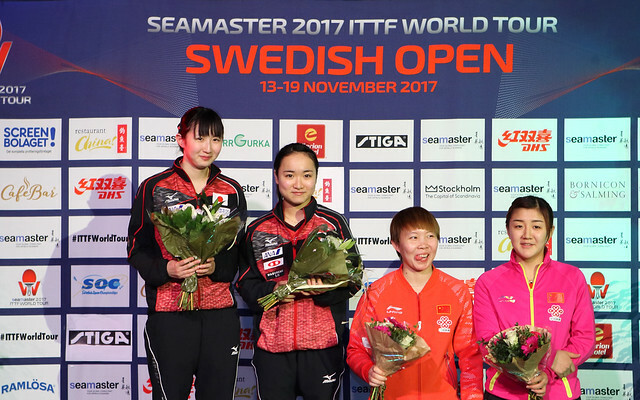 Victorious in 2013, the hopes of Chen Meng repeating the feat were quashed at the quarter-final stage of the Women’s Singles event at the Seamaster 2017 ITTF World Tour Swedish Open in Stockholm on the afternoon of Saturday 18th November. The no.3 seed, she was beaten by Chinese national team colleague Chen Xingtong, the no.8 seed (9-11, 11-7, 11-6, 6-11, 11-6, 8-11, 11-4). Arguably the more powerful player, Chen Meng captured the first game, she made the better start, she was never behind but the decision was only reached by the minimal two point margin. Rapid fire exchanges with the forehand top spin strokes executed by Chen Xingtong potent, ever warming to the occasion; she secured the second game as Chen Meng made errors in the latter stages. The third game very much followed the pattern of the second, close at the start, level at 5-all, before the Chen Xingtong forehand moved into an extra gear. It was very little different in the fourth game, only the decision went to Chen Meng. Once again in the fifth game, there was little to choose at the start; Chen Xingtong established a 6-4 lead, at top speed she accelerated to 10-6, securing the game at the first opportunity. Positive, Chen Xingtong won the first two points of the sixth game, Chen Meng responded, she went ahead 8-4, at 10-7 she held three game points; at the second attempt she converted; thus a seventh game beckoned. Fast close to the table exchanges, no player able to gain more than a one point advantage until from 4-all, after changing ends Chen Xingtong went ahead 6-4; Chen Meng called “Time Out”. Quite amazingly with nothing to choose between the two players in the first eight points of the seventh game, Chen Xingtong won seven in row to seal the contest. A fine effort, Cheng Xingtong is a name to note.